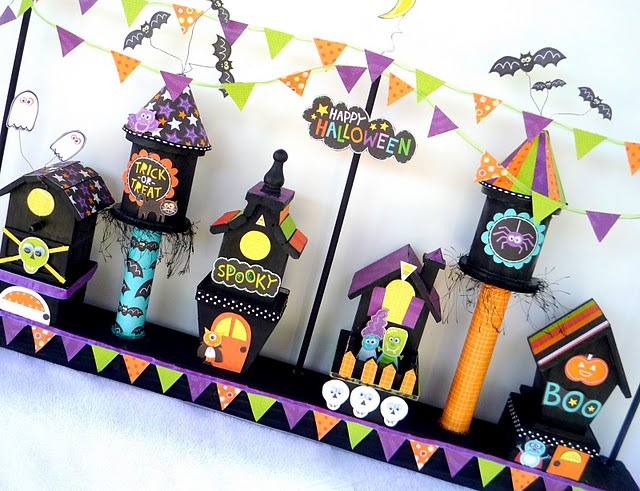 Amanda's Parties To Go: Get Your Spook On! 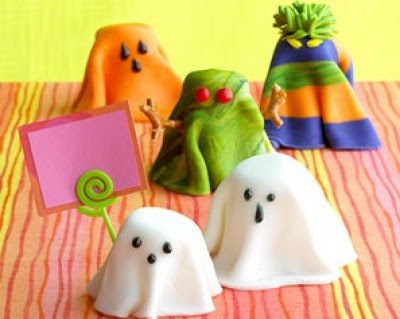 Cute Everything has a great idea from Parents magazine - marshmallow ghosts. It's a large marshmallow with a layer of fondant draped over it. And if you've never used fondant, don't be intimidated. It's really easy -- just like playdough with better taste! I recommend making your own marshmallow fondant though. Store bought fondant can taste like soft cardboard -- marshmallow fondant is pure sugar bliss..... marshmallows, powdered sugar and shortening. How could that NOT be good?? 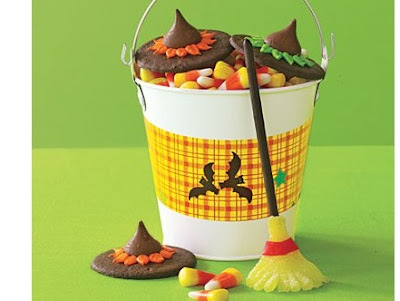 Another quick and simple treat, Witch Hats and broom sticks from All You magazine made with a chocolate wafer cookie, some icing and a Hershey's kiss. 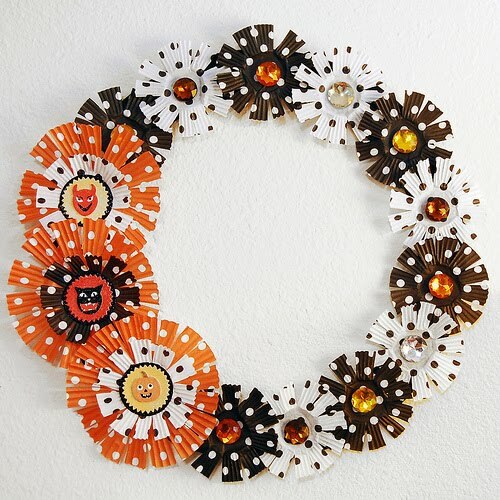 A fabulous wreath idea I wanted to share - simple, too! Just cupcake liners and a few stickers from Alexa at The Swell Life. This one is A.D.O.R.A.B.L.E.!! And such a great family keepsake for years to come. 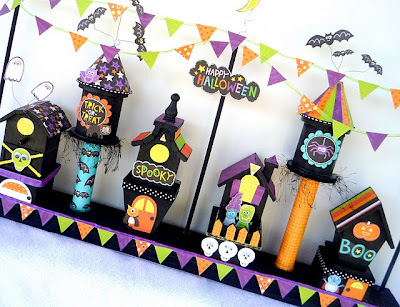 A Haunted Village all made with bird houses and scrapbook paper from Crafty Sisters. Involve the kids and make it a project day they won't soon forget. 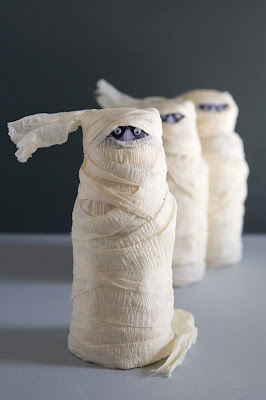 And look at these mummy wrapped drinks from One Charming Party -- simplicity at it's best. Crepe paper and a bottle of juice -- that's all folks. She used a free eye download that you can print at home, but I think googley eyes would be even cuter for young kids. She's got a quick tutorial so go check it out and maybe make them for a classroom Halloween party -- those kids would be so excited! And this next one reminds me of the only real problem with Halloween -- all of that CANDY! Or should I say all of those days afterward with the kids begging for their treat bags, leaving candy wrappers tucked away in the couch cushions for us moms to find later, and of course, the astronomical dental bills that will surely follow. 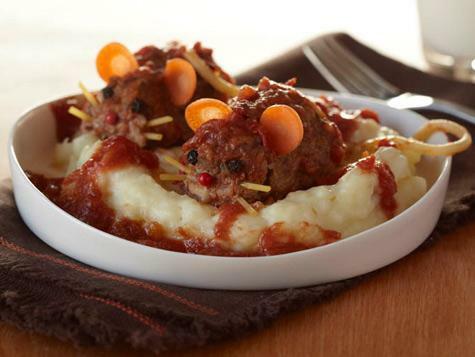 A rats baked in blood casserole from Kaboose.com. Sick, yes. But I kind of thinking this might actually work! Only a couple of weeks left until the big day -- so many ideas to share! Have a great weekend and War Eagle! !